Just this week I got hooked up with a project for Backpacker Magazine to log my hike through GPS. At first it seemed like an overly daunting task. Too much time plugged in, worrying about quality of the finished product, dealing with battery life and the like. In short, it seemed too much like work! I’ve come to grasp with that though and I’m no longer fretting. It’s actually kind of fun to log way points. I get a decide what’s worthy and what’s not. And for especially worthy spots it pushes me up the trail with aplomb, knowing that once I crest the ridge I get another way point! In reality it is work though. I’ve whittled it down to a few simple compromises. First is weight. The unit plus ten days of batteries weighs one pound. That’s “a lot” when one considers how much time, money and comfort I’ve parted with to loose a pound in other pieces of gear. I’ll have to stop for five seconds every time I take a way point so that I can write down it’s name. And I’ll have to be more connected to the postal service hours of operation for battery resupply. My original plan was pretty much a pure buy as you go strategy. Now I’ll have to pick up battery packages in more places because I’m going to be using lithiums. I’m deciding now how I want to balance buying batteries as I go and having them mailed to me. When I’m done, I’ll have something to be proud of, a connection in the magazine and more money in my pocket. I’m literally getting paid per mile! YEEEEEHAW! o those whom suggest not hiking the PCT as a form of protest against trail markings, I think you’ve missed the point. If you wish to hike a trail that is fully marked and fully safe, go hike the AT or the Bay Area Ridge Trail. If you want to hike the PCT, famed for it’s “wilderness qualities”, then accept that maintaining that characteristic is a noble thing. We’ve paved and signed most of the world. I personally like that there are places in this world where you can walk long distances having to watch your step. What troubles me is that the discussion of reducing trail risks can go too far. Already, people are talking in broad strokes about “dangerous sections”, not just Fuller Ridge. Should we put a bridge over every “dangerous” stream? A lightning rod or a hut on every pass? Water caches in the desert? (oh wait..) All of these things might seem very reasonable. But it’s a slippery slope. After we’ve taken care to mark Fuller Ridge, surely people will want to mark another new area. I REALLY don’t want to hike a trail that has a marker every 200 feet. Do we want someone to put wands up through the Sierra this year so that we can stay on trail? Forester has posed a particular risk to a wide variety of people. But I’d hate to see it fixed with ropes. If you want ropes, go climb Everest. Keep Forester Free. This discussion has been going on for a long time in Wilderness Areas. What modifications should we allow to create safety in a backcountry setting? I think that the Wilderness Act strikes a decent balance. Trail blazes are discouraged, mechanical tools not allowed, huts taken down,… Risk is created again. Yet they still maintain trails and supply maps. It’s doable but not easy. Safe but still risky. I’m sure that many (most?) PCT hikers value wild wilderness. I’m hopeful that the PCTA does as well. I greatly appreciate all of the hardwork that goes in to maintaining the trail and helping out hikers. But there is still a limit. I wouldn’t want someone sweeping the trail before me, thank you very much. 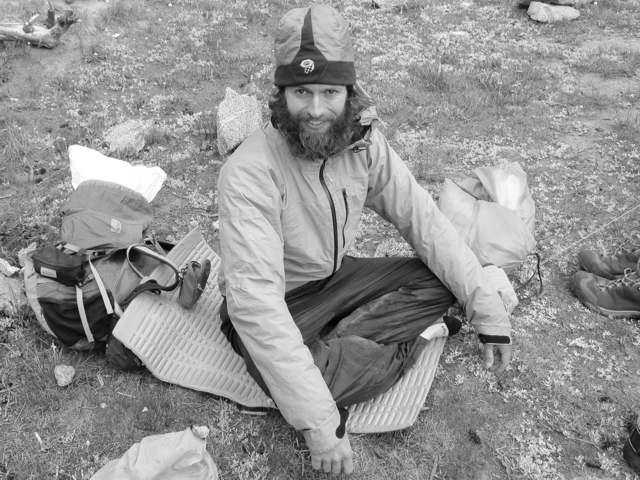 My reasons for maintaining wildness on the PCT aren’t merely aesthetic. I genuinely think that we get more out of nature than a pretty picture. That’s enough of this never ending debate for me. Let’s continue it on the trail someday.